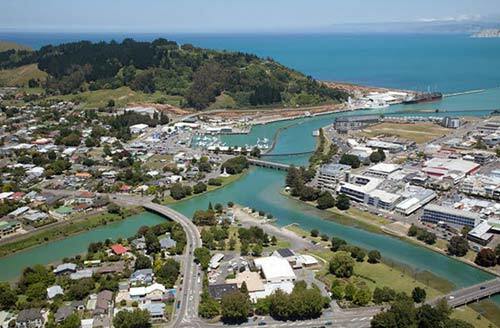 Gisborne, the principal settlement of the East Coast, is a city of three rivers and many bridges. In this view, looking south-east across the city, Tītīrangi Domain (Kaiti Hill) is in the middle distance and the three rivers – Waimata (left), Taruheru (lower right) and Tūranganui (below Kaiti Hill) – can all be seen. The main business district is at middle right.